Running away from Canada, Mariana hopes to forget a failed marriage and the death of her husband by embarking on a whole new life. She moves lock, stock, and two cats to the small Caribbean island of Bequia. But the move brings more than she could have imagined. New friends ask her to help solve a recent murder in the expat community. And then there’s the problem of her neighbours, a young woman and her children. Seemingly abandoned by family and friends, Mariana believes they need her help! By becoming involved, Mariana is carried along from wanting to simply “live with the locals” to being overwhelmed by their culture, one so vastly different to what she had left behind in Canada that she doesn’t know who among her expat friends she can turn to for advice. So she carries on regardless and discovers that Bequia isn’t exactly the tropical paradise it had promised to be. 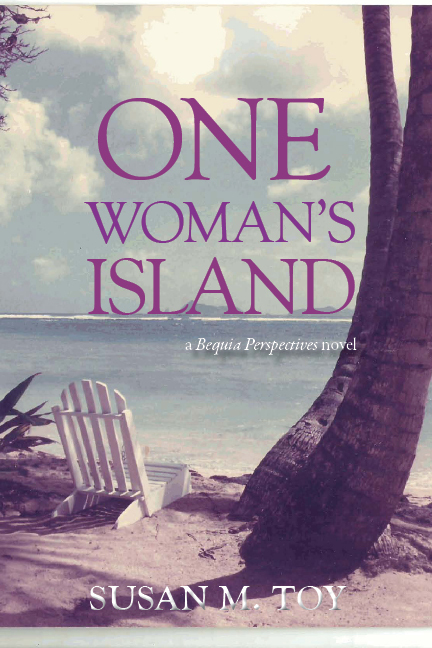 One Woman’s Island is the second novel in the Bequia Perspectives series that picks up again a few months in time after the first novel, Island in the Clouds. Recently widowed, Mariana escapes to Bequia for a much-needed retreat. Almost immediately, she is swept up into the lives and dramas of those around her—locals and expatriates. Mysteries abound, from the theft of her personal belongings to the unexplained, sudden deaths of expatriates. Fascinated by her neighbors, she vows to help them, but will this prove to be more of a challenge than she expected? One Woman’s Island provides a candid look into the small island of Bequia. Mariana and the diverse cast of characters in this book provide a glimpse into a world where expats and locals interact in a very unique way. The hired help often call the shots and while there is interaction between the two groups, there is an unspoken set of rules in the way the locals and expats interact. Mariana, like many expats who have come before her, sets out to help her neighbors, but some of her more experienced friends warn her of the pitfalls of crossing that line. Her North American perspective of right and wrong isn’t necessarily an appropriate guide on Bequia. Western standards and moral codes don’t always apply. I don’t always agree with the steps Mariana takes on her journey toward self-discovery. She can be stubborn and headstrong, but this is what makes it a good story. The author allows her main character to make mistakes and to face some of her misconceptions head-on. It’s worth mentioning that some of the greatest insights in this book come from secondary characters, and from those whom you’d least expect to carry such wisdom. This book is definitely worth reading. Thought-provoking and well-written, One Woman’s Island was a captivating and enjoyable read from beginning to end.